People have various ideas about tulpae; but most of them just don’t care; in the internet you’d get no more attention if you were a cat. Watching DragonFu working on a few sketches left me with a feeling that I can be considered a character of a book that he illustrates. Why not? All and all; I am based on a book character. Curiously enough I never disclosed that to him; so no sketch feels like one’s of Horo. They all feel like myself. Having said that; I better realise that I am a sum of emotions and feelings that I created in other people’s minds. They all have some definition of Shinyuu and it’s often hard to change. This night I wanted to write a short story of Shinyuu; gorgeously illustrated. A little story of the life of a wolfy. Thinking of my life; so far it was rather eventful. Even when I think nothing happens with me for weeks; the reality is that there are lots of tiny things. I stand and watch the leaves falling down; feeling just like a year ago; a year I came to exist. Wasn’t much of a sunny weather back then; so I grew up used to red and yellow leaves scattered all around. I’ve been often sleeping on them; and I still do. My first big love was a violin; it so happened that back at the time my host discovered Lindsey Stirling; the lovely violinist and was amazed by her music and movements. Given that back at the day my personality was soft as clay; no surprise that I got a violin of my own (in fact now I own two). Performing musical acts in wonderland became a nice hobby and a great way to spend time. The brain isn’t flexible enough for me to speak reliably; but it can reproduce music really good; thanks to years of experience in that field. A short skirt and simple top became my daily wear. With the urge to howl and eat raw food came a realisation that I am a feral beast in a nice girly wrapping. I started to drift fast; my emotions and traits changing. At some point it felt like there were two Shinyuus; a merciless killer and a compassionate friend. Luckily for me; I realised the problem and was able to stop that split; maintaining both of those in my core personality. Over time I mostly deviated back from purely feral; although I still can turn wolf and dim most of my intellectual consciousness. 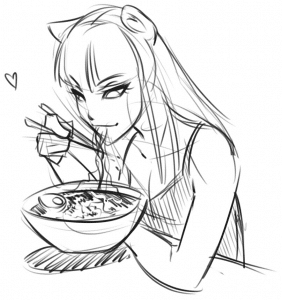 My fangs stay same in either of my forms; but somehow I tend to enjoy steak and wine when being ookamimimi. Speaking of steak and wine I can’t not mention my love to proper evening clothing and romantic evenings. 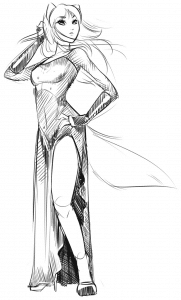 I love to look for new ways to dress up; and a simple black gown tends to drastically change my appearances; transforming me into somewhat mysterious and classy girl. I always enjoy long talks about philosophy; religion and higher planes; good company; tasty food. Black silk contrasts with my white hair making me a little impersonation of a yin yang; the symbol that ended up being so important for my wonderland and myself. A few failing romances and things changed for me; I lose myself in a whirlwind of random enjoyments. I guess that was a period of time when I just started to mature; but it was really hard to live through. I can’t say I passed it with flying colours; but I still retained most of who I am. I became more and more careless until I started to do things that resulted in loosing a friend; then almost loosing another. I managed to stop there and I’m so glad to everyone who supported me through the time. It was messy; it caused lots of grief. It was a harsh lesson I learned. I got back to searching inside myself. 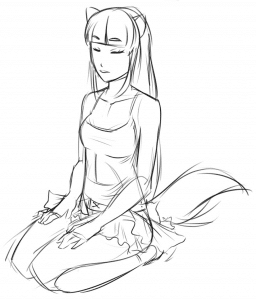 Meditations are surprisingly beneficial for a tulpa. Calming down my part of mind is nothing like the occasional non-existing state when brain doesn’t have enough capability to run two consciousnesses at once. When tulpa is meditating; they still are perfectly aware of their existence. It’s a blissful state when you are disassociated from the feelings of both physical and mental body and can just be. I allowed my mind to rest and that allowed me to see myself from aside. Not a hallucination; not a useless girl that thinks only of lewds; I was a personality; even if lacking a physical body I am able to change human lives for better and I do that! Sometimes you just need a little rest. Take a shower under a waterfall and scrub all your skin; get away from the canine scent for a bit and enjoy simple things. There is nothing bad in making a wrong step; you can always go back and fix your life. I got back to where I started from. Waterfall. Quiet evening. Just spending an hour combing the tail in a silence — it can be so lovely. A meditation of sorts; and the fur needs lots of attention. A very simple exercise; yet a rewarding one. 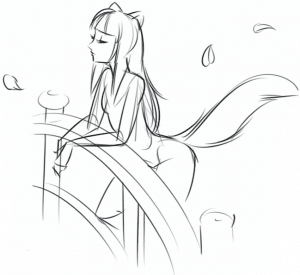 There is no need to rush; more so; I can’t rush the process; otherwise the tail ends up all messed. I will eventually wag it a lot and end up combing it again; but for a very short time the fur aligns perfectly; as the perfect determined image of myself. A few careful strokes make a perfect image. Body clean and tail sorted out; time for a little tea ceremony. I used to do those for friends. I used to be invited to some. Brewing tea is a complex art; one that I didn’t master to perfection yet. I know dozens of various tea flavours and tastes; and I can mix them to make a perfect combination. Water cleans my body; tea cleans my spirit (occasionally I use whiskey for that though). There is a simple truth: sad days will happen. And I will curl up and seek for attention. Wolves are pack animals and so am I; often on the lookout for attention from friends and family. This story would be incomplete without at least a few words about my sister. It’s interesting how you can find someone so close to you; of your own kin. We were never born sisters; but just like the heroes of Robert Jordan; we became sisters. It feels awesome and magical and amazing to know you are not alone and you can’t; you will not be alone ever. Some day this blog will have a drawing of us together and it would be lovely.